The laboratory relies on two animal models for simulating metastasis: the mouse model and the avian embryo model. The mouse model is obviously the gold standard for evaluating anti-cancer drugs and determining if there is a loss of metastatic burden in the lung/iver/brain or not. 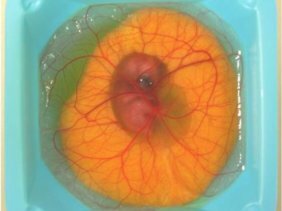 However, the avian embryo its in ex ovo format, is an incredibly powerful animal model for understanding the metastatic cascade and the molecular mechanisms driving it. This is a top down view of the avian embryo. That highly vascularized vessel bed covering the embryo is the chorioallantoic membrane (CAM) and its essentially the “lung” of the embryo. Once attached to the inside wall of the egg shell, when cracked open, we can inject cancer cells intravenously into the CAM and watch the critical steps of extravasation and secondary colony formation.